Codecademy is an amazing new startup that brands itself as the easiest way to learn to program. In only 8 short months, they have raised $2.5 million from some of the best investors in startups, gained over 1 million users, launched an incredibly successful Code Year initiative that garnered over 350,000 signups (including NYC Mayor Bloomberg! ), and formed a partnership with the White House. In 8 months! I want to dig in and understand why they have done so well in such a short period of time. Codecademy was able to generate a lot of press early in their launch through their involvement in the Y-Combinator incubator program, even being named one of the top 5 startups to watch from their class. Their launch on Hacker News generated over 200 comments, tons of positive feedback, anad gave them over 200,000 users within 48 hours of being live. This lead to coverage on TechCrunch and several other startup blogs, which then drove more users and signups. Codecademy also did some other brilliant things to capitalize on this early interest – I’ll get into that later. Another major factor in their early success has been their investors. When they launched their Code Year initiative, every one of their investors Tweeted about it. Fred Wilson had 1 tweet about it that was shared over 67 times, and a blog post that garnered over 190 comments. This endorsement from some of the most respected people in the startup ecosystem helped spread Codecademy’s Code Year initiative like wildfire. Codecademy is a great example of a startup that beat others before it due to fantastic positioning and targeting. Although not the first company to use an interactive interface to teach programming, they were the first to put a story behind that interface. Rather than just teaching people to code, Codecademy positioned themselves as “the easiest way to learn to code”. Behind this idea, they told a story about how programming is the new literacy, and a necessity in today’s software-heavy world. This story ties in perfectly with high unemployment and a poor economy – they paint Codecademy as a way to learn a highly-coveted skill, one that will always be in demand. This is something TryRuby, Codeshool and Treehouse all lacked – they were better tools that knowledgeable people could use to brush up on their skills. Codecademy provides a story – a way to develop a new skill, and a potential solution to today’s economic problems. Codecademy also had one of the best startup marketing campaigns in recent memory with their Code Year initiative. Fred Wilson does a fantastic job of breaking down the success of the program here, but a startup generating over 370,000 users with one initiative is almost unheard of. Code Year is a brilliant play on New Years resolutions and ties in perfectly with their story of developing a new and in-demand skill. On top of this initiative, they made it extremely easy to share one’s resolution on Twitter, a decision that resulted in over 55k tweets about Code Year. People naturally want to share goals that make them look good, and resolving to learn a new skill certainly falls into that category. This is where Codecademy gets really interesting. Imagine you’re a programming novice and you get referred to Codecademy’s website. Rather than ask for anything from you (email address, signing up to take a course, etc.) all you see is a plain box waiting for you to take a simple action – just typing your name. 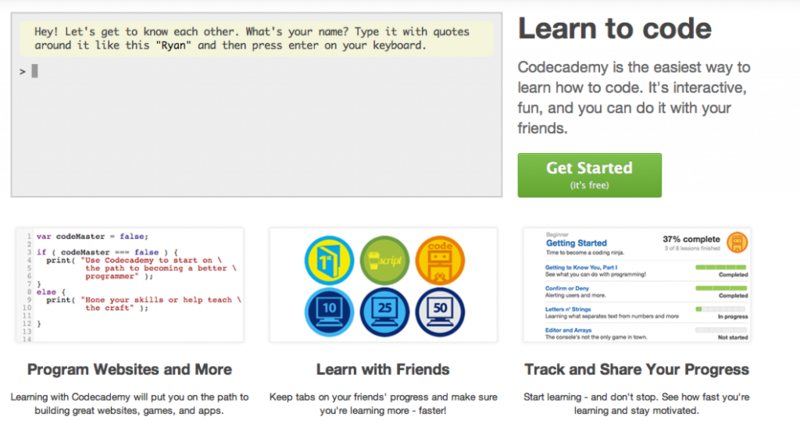 On the right, Codecademy promises that you can learn to code. BJ Fogg defines simplicity as providing the minimally satisfying solution with the lowest cost. Thinking of their homepage in these terms, Codecademy does perfectly – their homepage promises to teach you how to code, gets you started in the simplest way possible, and costs almost nothing in terms of time, money or energy. If someone comes to the site even marginally motivated and interested in learning to code, their simple and easy homepage will capture their enthusiasm and allow them to play around with a very basic coding function, with no investment on their part. This is a perfect example of a trigger (another BJ term) that succeeds due to its ease and motivated users. Once a user has engaged in the simple action required, Codecademy’s interface draws them in and encourages them to sign up later in the process, once they have invested something in the site. Compare this to a site like Codeschool that forces you to pay for their courses, decide what you want to learn and complete a transaction before learning any coding. Codecademy also does a great job of motivating individuals once they have used the application. With each accomplishment or lesson finished, a user is awarded a virtual badge for their achievement. This turns learning programming from something difficult and potentially disheartening into a game and a challenge. The badges are especially effective because they are awarded sporadically, and you get one after completing your first exercise – even more incentive to stick around and finish other lessons. The more lessons you finish, the more badges you rack up. In addition to badges, Codecademy also has a courses list that shows you how many courses are available, what percentage complete each of the lessons are, and an overall progress bar. This further drives motivated users to finish as many lessons as they can in order to reach 100% complete – gamification at its finest. Simplicity and badges get the user in the door and help create incentives to complete more lessons, but programming is a difficult subject and takes a long time to learn. Codecademy does an impressive job of mitigating this with their Code Year program. Rather than intimidate novice programmers by presenting them with a long list of lessons (similar to staring at a 500+ page book you have to read), they send one lesson each week via email. This breaks up the learning into manageable chunks, and drives user engagement. If you like the site but only used it a few times, every Monday Codecademy presents you with a chance to re-engage with their tutorial and learn a valuable skill. This type of drip marketing is brilliant for encouraging user engagement, and psychologically makes programming far more manageable. As someone who’s tried to learn to program six separate times in my life, often by buying ebook tutorials, I really appreciate the chunking of the lessons. There was nothing more disheartening than getting stuck on page 75 of a 600+ page Ruby on Rails ebook, especially as a beginner. Codecademy does a great job of removing that feeling of despair and providing small incentives to learn – just another reason why they are doing so well. In case you didn’t notice, your title font is horribly unreadable. Don’t mistreat your readers.